A new program aimed at improving water quality in the nation’s heartland by using watershed-scale conservation to reduce nutrient runoff from farms was highlighted Tuesday (March 22) at a White House Water Summit. The program is spearheaded through a collaboration between the University of Notre Dame Environmental Change Initiative and Indiana University. The Obama administration, in conjunction with the United Nations World Water Day, hosted the summit to raise awareness of water issues and potential solutions in the United States. The goal of the summit is to catalyze ideas and actions to help build a sustainable and secure water future through innovative science and technology. 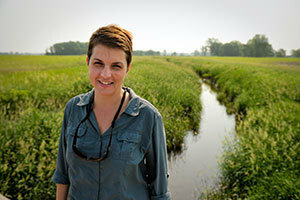 “What a thrill it is to have our research highlighted at the summit, bringing our data from the nation’s heartland on how conservation can benefit both farmers and the environment,” said Jennifer Tank, the Galla Professor in the Department of Biological Sciences who leads the initiative. The Indiana Watershed Initiative was funded through the USDA Regional Conservation Partnership Program and pairs two promising conservation practices, winter cover crops and floodplain restoration of waterways. The project will quantify how watershed-scale conservation can improve water quality in an effort to successfully meet national goals for reducing farm nutrient runoff by 40 percent. The project will quantify the soil and water quality benefits due to the planting of winter cover crops and the installation of floodplain using two-stage ditches in two Indiana watersheds, located in Kosciusko and Jasper counties. The project pays farmers to implement conservation on the ground practice over four years, with the goal of achieving adoption cover crop coverage on 85 percent of cropland acres, and to install the two-stage ditch along the majority of channelized ditch. The research team is focusing on these two conservation practices because they provide a practical solution to prevent nutrient and sediment loss from crop land. Another key component of the project is to accurately estimate the full suite of costs and benefits incurred through conservation implementation. The project team, with collaborators at Iowa State University, and additional support from the USDA Natural Resources Conservation Service, USGS, The Nature Conservancy, Walton Family Foundation, Indiana Soybean Alliance and Indiana Corn Marketing Council, recently announced the expansion of the project to include economic valuation. With farmer cooperation, the team will quantify the economic and environmental benefits of on-farm conservation. Results from the analysis could help promote implementation of on-farm conservation practices across the 11 million corn and soybean acres in Indiana. Originally published by William G. Gilroy at news.nd.edu on March 22, 2016.